Anyway, the taste was GREAT!!! I may do it outside next time, with the griddle on the gas grill. I also made a batch of hummus, which is SO easy and we eat it all the time. 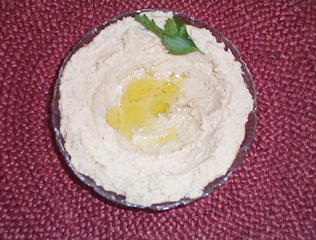 There are as many recipes and variations of hummus as there are stars in the sky. Well, not exactly, but almost. Anyway, here is what I did today and my hubby Tim was thrilled! He said the tastes were fantastic! Place all the ingredients in a food processor. Blend until smooth. Taste and adjust seasonings. Variations: Some people add cumin or hot sauce for a spicy taste. Traditional recipes call for extra virgin olive oil instead of the water. 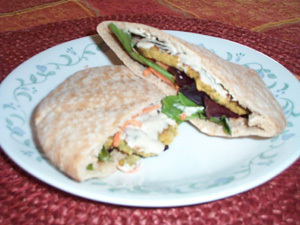 It was served in Israel drizzled with olive oil and cooked whole garbanzo beans as a garnish. organic salad greens, tomatoes, pickles – whatever! In a food processor, pulse the onions and parsley until coarsely chopped. Add garbanzo beans, garlic, cumin, salt, pepper and baking soda. Process until mixed well, but do not over-process. The mixture should be smooth, but not runny. Transfer mixture to a mixing bowl. Stir in the flour and mix well. Cover and let sit, at room temperature, for 30 minutes or refrigerate up to overnight. At this point, you can transfer the browned patties to a parchment-lined baking sheet and bake in a preheated 400° degree oven for about 10-12 minutes, or, as I did, finish cooking on the griddle, another 5-7 minutes or so. They should puff up slightly. A student of health and nutrition for 40+ years, Vickilynn Parnes has over 30 years of actual hands-on experience reviewing and personally using different tools of the homemaking vocation, focusing on the areas of health and nutrition. Vickilynn is a magazine columnist, product reviewer, cookbook author and radio talk show host, as well as being full-time mom to 5 children. Real foods are those foods that are unprocessed or minimally processed; more natural, the way that God created them. We desire to return to this simpler way of eating. We prefer foods that are locally-grown or raised, organic, and seasonal. We desire to make our meals from the whole foods whenever possible.